KANSAS CITY, MO. — Jayhawks head coach, Bill Self, will be the keynote speaker at the University of Missouri Kansas City’s 2nd Annual ’Roos Tip-off Dinner to be held on Sept. 30 at the College Basketball Experience. Michigan State Coach Tom Izzo served as keynote speaker at last year’s event. Tickets start at $100. Photo shows Kansas coach Bill Self speaking to Reid Forgrave at Fox Sports Live on Nov 13, 2013 about Andrew Wiggins, the season outlook and tradition in Lawrence, Kansas. Bill Self has been the men’s basketball coach at Kansas since 2003. He led the Jayhawks to the 2008 National Title and was named AP Coach of the Year in 2009. Self is also a popular motivational keynote speaker and is available for speaking engagements, charity fundraisers, personal appearances & corporate events. Watch the following video where Kansas coach Bill Self speaks to Reid Forgrave at Fox Sports Live on Nov 13, 2013 about Andrew Wiggins, the season outlook and tradition in Lawrence, Kansas. Sports Speakers 360 is a booking agent for pro athletes and coaches. 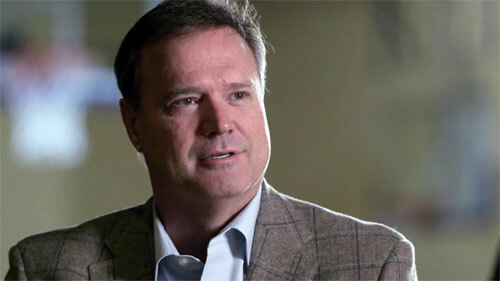 If you would like to book Bill Self for a speaking engagement, appearance or endorsement, contact Bill Self’s booking agent for fees at 1.855.303.5450.